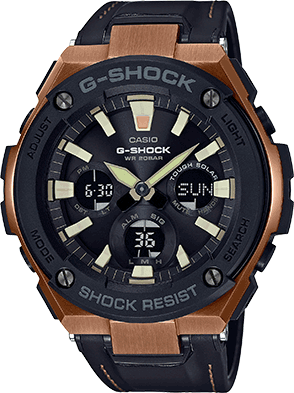 These new G-Steel models come with layer guard structure for outstanding shock resistance. New tough leather cobines resin with synthetic leather for a band that is water resistant, and has better wear resistance and tensile strength than leather materials of the past. The multi-dimensional face features large hour markerts and hands that have an ivory texture. The GST-S120L comes in a choice of twocolors: black and rose gold, black and mustard. Approx. battery life: 8 months on rechargeable battery with normal use. 19 months on rechargeable when stored in totaldarkness with the power save function on.